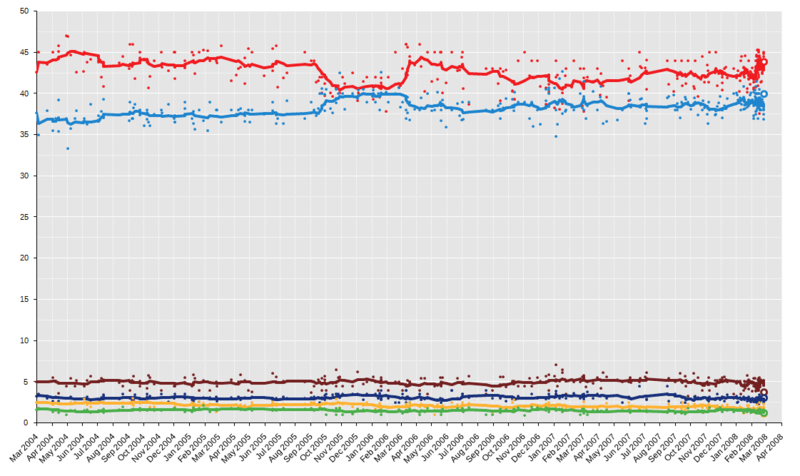 After four years of growing bipolarisation of Spanish politics, the election saw a record result for both ruling Spanish Socialist Workers' Party (PSOE) and opposition People's Party (PP), together obtaining more than 83% of the vote share—over 21 million votes—and 92% of the Congress seats. The PSOE under José Luis Rodríguez Zapatero benefitted from tactical voting against the PP and emerged as the most-voted party just 7 seats short of an overall majority. On the other hand, Mariano Rajoy's PP saw an increate in its vote share and seat count but remained unable to overtake the Socialists. United Left (IU) had its worst general election performance ever with less than 4% and 2 seats. Regional nationalist parties Convergence and Union (CiU), Republican Left of Catalonia (ERC), Basque Nationalist Party (PNV) or Aragonese Union (CHA) were also hurt by the massive tactical voting towards the PSOE, falling to historical lows of popular support. 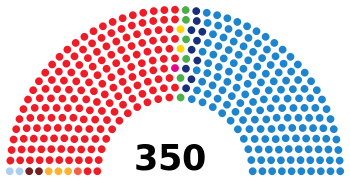 Union, Progress and Democracy (UPyD), with 1 seat and slightly more than 300,000 votes, became the first nationwide party aside from PSOE, PP and IU entering in parliament in over two decades. 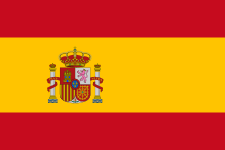 Zapatero was sworn in as Prime Minister of Spain for a second term in office in April 2008, just as the Spanish economy began showing signs of fatigue and economic slowdown after a decade of growth. By tradition, the first candidate on each Madrid party list for the Congress of Deputies is the Prime Ministerial candidate for that party. Nationalist parties who did not expect to win enough seats to be contenders for the office of Prime Minister typically designated one of their list leaders as their main candidate. Those candidates were generally featured more prominently in the Spanish national media than other list leaders or candidates. Regional, provincial and local media nearly always covers the activities of the Prime Ministerial candidates, together with the leading candidates in their area. On 9 March 2008, José Luis Rodríguez Zapatero won the general elections. 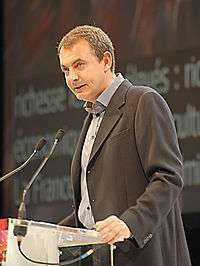 As in 2004, the governing Spanish Socialist Workers' Party (PSOE) was led by Prime Minister José Luis Rodríguez Zapatero. Mr Zapatero was the only PSOE candidate who sought the nomination and he was therefore proclaimed candidate on 25 November 2007 at a rally in Fuenlabrada, Madrid. The PSOE ran in all Spanish constituencies. In Catalonia, the Socialists' Party of Catalonia (PSC) operated as part of the PSOE's ticket. The current Deputy Prime Minister María Teresa Fernández de la Vega led the party's list in the province of Valencia. After the election, she continued as Deputy Prime Minister. José Bono Martínez, former Minister of Defence and President of Castile-La Mancha for 21 years, led the list in Toledo. After the election, he was elected President (i.e., Speaker) of the Congress of Deputies. After some discussion due to the need for ensuring the future support of the Prime Minister for his economic policy and his intentions to retire, the current Second Deputy Prime Minister and Minister of Economy and Finance, Pedro Solbes, was second on the Madrid list. He continued as Minister of Economy after the election. Other prominent politicians who led provincial lists for the Socialist Party included the current Minister of Culture, César Antonio Molina, in A Coruña, the current Home Minister, Alfredo Pérez Rubalcaba, in Cádiz, the Minister of Public Works, Magdalena Álvarez, in Málaga, the former Minister of Housing (and later Minister of Defence) Carme Chacón, in Barcelona and the former Home Minister and current Socialist Parliamentary Group spokesman, José Antonio Alonso, in León. There were relatively few disputes about the composition of the election lists, except for minor problems on the Balearic Island of Formentera and in the capital. In Madrid the selection of the remaining candidates on the list after the socialist leadership (Prime Minister Zapatero, Second Deputy Prime Minister and Minister of Economy and Finance Solbes, and the electoral coordinator Jesús Caldera) was unclear, since the regional socialist federation had recently changed their leadership. Besides this, Unión General de Trabajadores (UGT), an old federated socialist union, suggested presenting joint lists. The final decision by the PSOE leadership to include a deputy linked to UGT, Manuel de la Rocha, ended the discussion. PP President Mariano Rajoy (right) and Secretary-General Ángel Acebes addressed supporters outside the party headquarters on 13, Genova St. (Madrid) after the election. The People's Party (PP) was led by Mariano Rajoy, former Deputy Prime Minister and successor to the former Prime Minister José María Aznar. He was nominated as candidate by the National Board of Directors of the party on 10 September 2007. PP ran in all the constituencies with its sister party the Navarrese People's Union (UPN) acting as part of the PP ticket in Navarre. Rajoy chose Manuel Pizarro as his candidate for Second Deputy Prime Minister and Minister of Economy and Finance. Pizarro is the former chairman of Endesa, where he was noted for his criticism of the economic policies of Zapatero's Government. The People's Party suggested reducing taxes and raising the minimum threshold for Income Tax. Some controversy took place when the Mayor of Madrid, Alberto Ruiz-Gallardón, sought a place on the Madrid list for the Congress, something which increased his rivalry with fellow Madrid PP rank Esperanza Aguirre (president of the Community of Madrid and leader of the party in this Autonomous Community). The subsequent People's Party leadership's refusal was considered by the press as a victory for Aguirre, preventing him from taking advantage in the succession of Rajoy in the eventuality of an electoral defeat. Several left leaning media and political parties referred to this as a victory of the most radical, reactionary, sectors close to Aguirre over the so-called moderate way represented by Gallardón. Sources close to the People's Party denied such interpretations. Some newspapers even speculated about the possibility of internal conflicts between the supporters of each politician. However, the appearance of both politicians at electoral events together stopped or at least reduced criticism. With the People's Party defeat, there was some speculation over Rajoy's eventual resigning for future electoral contests. Then, at a meeting of his party's Executive Committee on 11 March, Rajoy dispelled doubts about his future by stating that he would stand again as party leader at a party congress in June. United Left (IU) is a coalition of several leftist movements. During the previous legislature, there had been internal fighting between the main component of the coalition, the Communist Party (PCE) and the faction headed by Llamazares. This led to a primary election between October and November 2007. This internal election was contested by Gaspar Llamazares, the then General Coordinator of United Left and Margarita Sanz, the General Secretary of the Communist Party of the Valencian Country - the Valencian federation of the Communist Party of Spain (PCE). On 14 November Llamazares was declared the winner, beating his contender by a wide margin. After that, three members of the Communist Party, who were most critical, including the former leader of it, Felipe Alcaraz, were expelled from the Directive Committee. IU ran in all constituencies; in many of them, they ran in coalition with other parties. In Catalonia, IU ran with Iniciativa per Catalunya Verds. Felipe Alcaraz, executive chairman of PCE, announced his intention not to seek nomination for Seville, another of the traditional PCE/IU seats and district where he had been deputy from 1993 to 2004, in the Andalusian Council of IU, after losing the provincial assembly, he was substituted by the former mayor of Carmona Sebastián Martín Recio who failed to gain a seat. The Assembly of EUPV (IU's federation in the Valencian Community) elected Antonio Montalbán as its leading candidate for Valencia, one of the traditional districts where IU or PCE have obtained deputies, against incumbent Isaura Navarro after heated debate on ideology matters and different stances regarding the convenience of keeping a coalition with another party, the Valencian Nationalist Bloc (BNV). The coalition with the BNV was finally discarded by the party Executive. This led to a schism within EUPV which saw incumbent EUPV MP Isaura Navarro, among others, defecting to a newly created party made up of critics with the direction of EUPV. The new party was named Iniciativa pel País Valencià (IpV) and ran in these elections in coalition with the BNV, the party which had been discarded by EUPV. Ultimately EUPV failed to hold their seat in Valencia (IpV-BLOC did not win any seat in this constituency either). The outcome of these elections proved a hard blow for IU, which got its worst ever result, obtaining two (S) down from five at the Spanish Parliament, subsequently Llamazares resigned in the immediate aftermath of the elections. In November 2007, Convergence and Union (CiU) designated their leader in Congress and leader of the Democratic Union of Catalonia Josep Antoni Duran i Lleida as main candidate. CiU only contested the four Catalan provinces. In August 2007, Republican Left of Catalonia (ERC in its Catalan acronym) designated their spokesman in the Catalan Parliament Joan Ridao i Martín as their leader for the elections. ERC ran in Catalonia and in the Valencian Community through its local branch ERPV. It also participated in an electoral coalition with other nationalist parties in the Balearic Islands constituency called Unitat per les Illes. ERC was the party with the biggest loss in these elections, obtaining three MPs, down from their previous eight seats. These bad results opened an ongoing internal dispute over ideology and strategies. The Basque Nationalist Party (EAJ/PNV) ran only in the three Basque provinces. Josu Erkoreka headed the ticket in Vizcaya, the most populous on the three provinces. In Navarre they were part of the Nafarroa Bai coalition. Canarian Coalition presented candidates in the Canary Islands. The Galician Nationalist Bloc ran candidates in Galicia. Basque Solidarity (Eusko Alkartasuna) ran in the Autonomous Community of the Basque Country but lost their solitary representative in Guipúzcoa/Gipuzkoa In Navarre they were part of the Nafarroa Bai coalition. The current deputy of the Chunta Aragonesista Singer-songwriter Jose Antonio Labordeta announced his intention not to run as candidate for the election and the party failed to hold his seat. Although the official electoral campaign period in Spain only lasts for the 15 days before the election, (with the exception of the day just before the election), many parties, especially the PP and PSOE, start their "pre-campaigns" months in advance, often before having finalised their electoral lists. The first phase campaign was done under the slogan "Con Z de Zapatero" (With Z of Zapatero), a joke based on the Prime Minister and socialist candidate's habit of tending to pronounce words ending with D as if they ended with Z. The campaign was linked to terms like equality (Igualdad-Igualdaz) or solidarity (Solidaridad-Solidaridaz), emphasizing the policies carried out by the current government. The second phase was done under the slogan "La Mirada Positiva" (The Positive outlook), emphasising the future government platform, and "Vota con todas tus fuerzas" (Vote with all of your strength), aiming to mobilize the indecisive or potentially abstaining voters. Another common slogan through all the campaign was "Motivos para creer" (Reasons to believe in). IU chose the pre-campaign slogan "LlamazarES + Más Izquierda" (LlamazarES (is) More Left), calling attention to their position as the third national party. A slowing down in the housing market, with prices even beginning to fall in some areas. Sharp increases in prices of some basic commodities. Global instability as a result of market uncertainty. The sudden emergence of the economy as a political issue came after several years of steady economic growth, and led some observers to suggest that maybe the government would have benefitted from calling an earlier election. In addition to those factors both the PP and the PSOE made competing proposals on taxation. ↑ CC–PNC results are compared to the combined totals of CC and PNC in the 2004 election. ↑ Andalusian Coalition results are compared to the combined totals of the PA and PSA in the 2004 election. ↑ "Royal Decree 33/2008, of 14 January, of dissolution of the Congress of Deputies and Senate and of the calling of elections" (PDF). Boletín Oficial del Estado (in Spanish) (13): 2607–2608. 15 January 2008. ↑ "El Periodico de Cataluña- 26/11/2007- Solbes confirma su permanencia en el Gobierno si el PSOE gana las elecciones legislativas". Elperiodico.com. 2010-06-14. Retrieved 2010-06-18. ↑ (AFP) – 10/09/2007. "Agence France Press". Afp.google.com. Retrieved 2010-06-18. 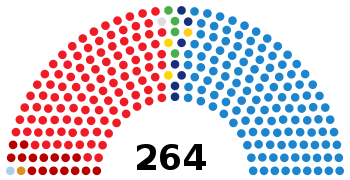 ↑ (AFP) – 15/01/2008 (2008-01-15). "AFP Manuel Pizarro podría ser ministro de Economía de Rajoy". Afp.google.com. Retrieved 2010-06-18. ↑ "Gallardón: ''He sido derrotado''". Elmundo.es. 2008-01-16. Retrieved 2010-06-18. ↑ "Post in the blog of Pepe Blanco, member of the direction of the Socialist Party". Elcuadernodepepeblanco.blogspot.com. 2004-02-27. Retrieved 2010-06-18. ↑ "''El PP de Vizcaya alerta de que la crisis de Gallardón puede "costar el Gobierno"''". Elpais.com. 2008-01-17. Retrieved 2010-06-18. ↑ "Zapatero's bear fight". The Economist. 2008-01-24. Retrieved 2010-06-18.